All Things Bindle teaches pet parents how to plan ahead for pet safety to reduce the number of pets needlessly abandoned during emergencies. We offer affordable, user-friendly pet luggage and travel accessories - starter, hands-free "bug-out kits" for canines and felines, designed to help pet owners prepare for the safety of their furry family in any emergency. BINDLE BUDDY BAGS™ are available in three sizes for dogs and one size for cats. Separate BINDLE SURVIVAL PACKS™ for dogs are also offered and include three BINDLE BUDDY BOWLS™ - our very own disposable paper bowls; each BINDLE KITTY KIT™ comes with its own survival kit. Please visit our Etsy Shop - ALL THINGS UBBY - for more details. 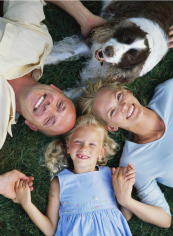 We can add your pet's name or most other personalization at no additional charge at this time. BINDLE'S ADVENTURES - LOST AND FOUND™ is a children's story that teaches pet lovers of all ages the importance of emergency preparedness for pets. 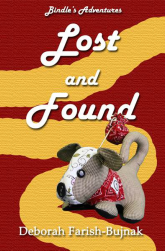 Available in print or eReader download, Lost and Found has been endorsed by the Animal Protective Association of Missouri. BINDLE, THE HERO™, a numbered and signed collectible doll, proudly carries his bindle, and is available for purchase. 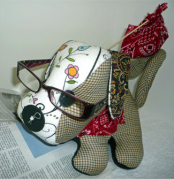 BINDLE is our storybook hero and is not intended as a child's toy.